Raising Maidens of Virtue Review!! Grace & Truth Books is a web-based Christian Bookstore stocked with a wonderful selection of printed and audio books on a huge array of topics for children and adults alike. I loved the website the first time I found it and it has been a favorite of ours for a long time. Dennis and Naomi Gundersen, the heart behind Grace & Truth Books have brought their passion for good, character building books for children to life as they launched not only a successful online bookstore, but also a publishing company with over 80 books published to date. The Grace & Truth Books website is beautifully designed and very easy to navigate. Categories of books are clearly labeled and the selection of products available is immense. I have found the prices to be very competitive and in several cases even better than some of the leading christian online bookstores. Can you tell I am a fan? Grace & Truth Books has become our go-to website for Christian resources, so I was thrilled when I found out the TOS Crew would be partnering with them for a review!! 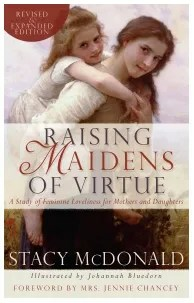 For this review, I chose Raising Maidens of Virtue- A Study of Feminine Loveliness for Mothers and Daughters by Stacy McDonald. The title caught my attention immediately as I have a budding pre-teen and I am trying daily to steer her in a positive direction although sometimes it seems like I am already losing ground. When I read the information about this book I realized that the target age was a bit advanced for my 8 year old (target age is 12-16, although some young ladies might be ready sooner or later depending on maturity), however I knew that it would be such a valuable resource to us in later years so I decided to forge ahead with the review. Raising Maidens of Virtue is a wonderfully rich bible study that combines truly grounded scripture studies with funny and touching stories that encourage conversations about topics such as guarding the tongue, personal care, modesty, friendships and so much more. 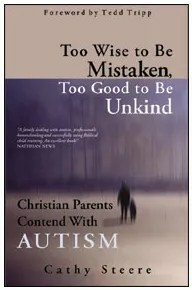 The book begins with several pages of descriptions of the way this book can be used in different situations. The common thread is whenever possible this book is best used with mothers and daughters together, learning and sharing information. It does give great tips about how you can incorporate other families into the study to bring a different twist to simply a mother-daughter study and even how you can use this in a Sunday School or other group setting. The first chapter of the book is a wonderfully sweet and encouraging letter to Mothers- a reminder of the ministry of motherhood and what a blessing our children are in our lives. I was so encouraged by the letter and the importance to share the information in this book with my daughter that I have found a way to start the study early with her and take it slow, at her pace. My daughter has always loved a tea party- from the youngest age I can remember she would beg me to come and play with her and share a cup of tea. As many times as possible I would join her, but those times that I was just too busy I could see the sadness in her eyes and it would catch my heart every time. In the business of life it has been a long while since she and I have shared a cup of tea- those times replaced with scooter rides in the front yard and playdates with her little friends. Oh how I miss her sweet voice asking, “Mommy, please have tea with me”. This sweet book quickly reminded me how the time with our little ones is so short, so I have decided that my sweet big girl and I will again have tea. I have set aside a time each week when we will go off together for a little while and share a cup of tea. I am confident that together we will be able to go through this book and the time spent will both strengthen our hearts and our spirits. Each chapter in Raising Maidens of Virtue has a single topic and each topic is expanded upon with grace and practicality utilizing real to life stories that beautifully illustrate the importance of the lessons being learned. At the end of each chapter is a “Share your Heart” section which encourages further study and conversation about the topic being shared. 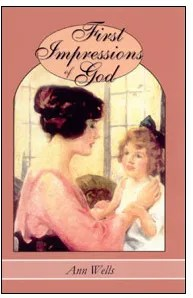 I think this book is a must have for any mother raising a daughter in the love and grace of the Lord. It is a valuable resource that will remain in our library for years to come and I feel sure that we will go through the study more than once, each time gleaning more and more as my little maiden advances in age. You can purchase Raising Maidens of Virtue from Grace & Truth Books for $18.50. Disclaimer- I received no compensation for this post. 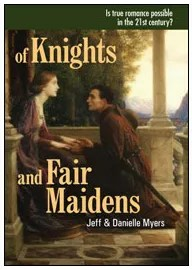 I did receive one copy of Raising Maidens of Virtue at no charge to assist in my writing this review. The opinions in this post are mine alone and were in no way influenced by outside sources.